The highest summit of Patagonia, Monte San Valentín (4,080 m), is at the north border of the NPIF (figs. 27, 41). In 1921, F. Reichert endeavored to reach its summit by way of Glaciar San Rafael, and Nordenskjöld attempted a route by way of Glaciar San Quintín, which he christened unofficially Glaciar San Tadeo. Reichert and Hermann Hess made five other attempts during the period 1939-42, but Monte San Valentín was first climbed in December 1952 by members from the Club Andino Bariloche (1954). In December 1963, Eric Shipton, J. Ewer, E. García-Soto, and C. Marangunic crossed the NPIF heading southeast from Laguna San Rafael to Río de la Colonia and accomplished on the way the second ascent of Cerro (Volcán) Arenales (3,365 m), a mountain that they recognized to be a volcano. They assumed it to be extinct, but a small eruption of tephra can be seen on Landsat image 30368-13444 (Path 248, Row 93) taken on 8 March 1979 (fig. 42). The second ascent of Monte San Valentín was not achieved until December 1986 by Philippe Modéré and others. In 1993, another French group led by Philippe Modéré completed the sixth ascent before making the second crossing of the NPIF from north to south. The exploration history of the NPIF has been published by Casassa and Marangunic (1987) and by Buscaini and Metzeltin (1989). Figure 41.--Monte San Valentín in the Northern Patagonian Ice Field. A, Monte San Valentín, the highest mountain in Patagonia, taken from the precipitous north flank on 27 November 1995. 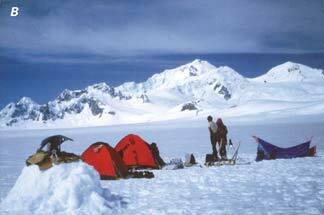 B, Camp for the drilling operations on the Northern Patagonian Ice Field (the accumulation area of Glaciar San Rafael) with Monte San Valentín in the background in December 1985. Photograph by Tomomi Yamada. Both photographs courtesy of Masamu Aniya, Institute of Geoscience, University of Tsukuba, Ibaraki, Japan. 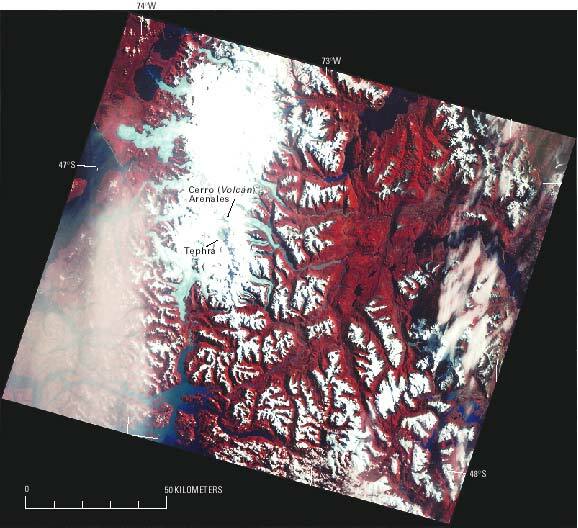 Figure 42.--Landsat 3 MSS false-color composite image of the Northern Patagonian Ice Field on 8 March 1979. The tephra airfall pattern is visible through the clouds on the southwest flank of Cerro (Volcán) Arenales (see fig. 27). Landsat image (30368-13444; 8 March 1979; Path 248, Row 93) is from the EROS Data Center, Sioux Falls, S. Dak. Of the many expeditions that have been made to the SPIF, the 11 treks made by the Salesian Father Alberto de Agostini between 1928 and 1944 are highlighted in his handsome book (Agostini, 1945), which includes many photographs of glaciers. Unfortunately, the precise camera position and orientation are never provided by Father de Agostini, so it is impossible to draw a sketch map of the FitzRoy or Paine groups from his photographs. The primary interest of most explorers focused on the east-to-west crossing of the SPIF. F. Reichert made the attempt in 1914 by way of Glaciar (Perito) Moreno (fig. 30), Kölliker, in 1933 by Glaciar O'Higgins and in 1916 by the Río Túnel valley (Sociedad Científica Alemana, 1917) (fig. 29), and Father de Agostini, in 1931 by Glaciar Upsala (figs. 29, 30). Hector Gianolini and John Mercer tried the crossing in 1949, Bruno Guth and others, in 1951, and Major Huerta and other Argentines, in 1952, the last three groups by way of the Río Eléctrico valley (fig. 29). All the expeditions reached or even crossed the interoceanic ice divide, but to cross the ice field entirely and come back was beyond their capability. Saint-Loup (1951) suggested starting from the west, where the main difficulties are found. This was done by Harold Tilman and Jorge Quinteros between 18 December 1955 and 28 January 1956. They crossed the ice field from Fiordo Calvo to the south arm of Lago Argentino and came back (fig. 30). (The CP had shown that Fiordo Calvo is less than 15 km from the ice divide. On the old maps available to Reichert in 1914, the nearest fjord was Fiordo Andrés at 35 km.) The many east-west crossings and the north-south crossing from Glaciar Jorge Montt to Glaciar Upsala by Eric Shipton, J. Ewer, C. Marangunic, and E. García-Soto from 10 December 1960 to 31 January 1961 (Shipton, 1963) (fig. 29) were arduous athletic undertakings but had little scientific value. More useful from a cartographic viewpoint was the official Chilean expedition of 1962-63 led by Lieutenant Colonel Florián Silva-Arce. With the patrol ship Lientur, they explored the Eyre and Exmouth fjords (fig. 29). At the Río de Los Saltos, they found the best way to reach the ice field at a snowy plateau christened Meseta del Comandante (Caupolicán), a way that avoided Glaciar Brüggen, which is heavily crevassed and impassable. They crossed the ice field to Río Eléctrico and came back the same way (oral commun., from E. García-Soto and C. Marangunic, who were members of the expedition). Since that time, Japanese expeditions have crossed the ice field from Fiordo Exmouth to Glaciar Upsala (December 1968 to March 1969) (fig. 29) and from Fiordo Falcón to Fiordo Europa (1971-72) (figs. 29, 30). In the following years, two British expeditions used sledges that had parachutes as spinnakers. Eric Shipton's expeditions in 1958-59 and 1959-60 (Shipton, 1963) had a goal, a unique one, that was to determine the geographic position of an active volcano known to exist in the middle of the ice field. Actually, Reichert had seen the volcano in 1933, but he published his discovery in his memoirs that were not widely read (Reichert, 1947). The Argentine expedition that had christened it Cerro Lautaro in 1952 did not recognize it as a volcano. When I analyzed the Trimetrogon survey aerial photographs of this area, I wrote that "Cerro Lautaro looks like a dissected volcano" (Lliboutry, 1956, p. 408), with an unknown crater northwest of it. 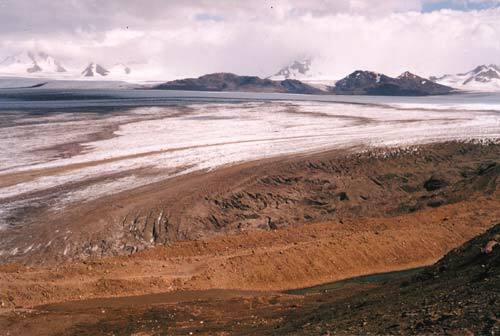 (I also stated that the strange unglaciated area at the lee of Cordón Mariano Moreno could be a maar; this conclusion proved to be incorrect when the feature was visited by Shipton during his first expedition.) In my analysis, I had used aerial photographs from Sortie 410 of 23 January 1945 rather than from Sortie 556 of 2 January 1945. On 2 January, tephra could be seen at the summit of Cerro (Volcán) Lautaro on its east side. Three weeks later, the freshly fallen tephra was again covered by snow. J. Ewer became aware of this fact and directed Shipton to the right site on his second expedition. The volcano was then emitting vapor and tephra from "a black fissure on the northern slope, about 300 feet below the summit." When Pedro Skvarca made his first ascent, from the southeast, on 29 January 1964, he found an 80-m-wide depression about 100 m below the summit, and some 50 m below it, he saw an opening within the ice of 2-3 m in diameter that had intense vapor and gas emissions (Skvarca, 1967). On March 1973, Leo Dickinson, Mike Coffey, and Eric Jones made the second ascent. 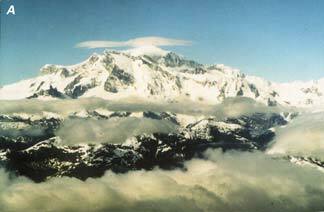 Next they climbed a secondary summit about 10 km northward, which they christened Cerro Mimosa. They found it to be a fumarolic volcano (Buscaini and Metzeltin, 1989, p. 207). I will not review here the many mountaineers who have gone to the FitzRoy area and climbed its impressive vertical walls of granodiorite (see fig. 38). Those readers interested in technical climbing should refer to the excellent, comprehensive book by Buscaini and Metzeltin (1989). The only scientific work carried out in this area was during the French expedition that made the first ascent of FitzRoy in January 1952 (Lliboutry, 1952) and during an expedition by Club Andino Bariloche in 1963 (Puente Blanco, 1963a). Cerro O'Higgins, farther to the north, was climbed on 1 March 1960 by the Chileans Espinoza, E. García-Soto, C. Marangunic, and R. Vivanco, and Cerro Steffen was climbed on 28 January 1965 by the Argentines Pedro and Jorge Skvarca. The same climbers and others have ascended most of the summits around Glaciar Upsala (Arko, 1979), in particular Cerro Bertrand, from which the view of fig. 34 was taken. Before becoming a glaciologist, Pedro Skvarca had climbed no fewer than 27 virgin summits of Patagonia! Farther to the south, some glaciological work can be reported. During the Italian expedition to Monte Sarmiento in Tierra del Fuego, some glaciological observations were made by Prof. A. Morandini. Nevertheless, the ground data that were compiled by Mercer (1967) in the "Southern Hemisphere Glacier Atlas" are very meager indeed. With the development of tourism, trekking, and technical climbing in the Argentine Parque Nacional de Los Glaciares, the access to the east side of the SPIF is now easy. The tourist center, El Calafate, on the south shore of Lago Argentino, has an airport. Classic tours are available by boat to the calving front of Glaciar Upsala and to the lodge at Bahía Onelli, as well as by road to the front of Glaciar (Perito) Moreno (figs. 30, 39, 43). During the summer, lodges are open at El Chaltél, 13 km southeast of Monte FitzRoy, and excellent guides are found there (fig. 29). Two journeys on the ice field have become classic: behind the Cerro Torre and Cordón Marconi, as well as to the Nunatak del Viedma (fig. 29) (the area that I erroneously called Volcán Viedma on my first map). This site to the east and in the lee of Cordón Mariano Moreno is a local ablation zone because of lower precipitation (fig. 44). In February 1945, the ice-free area was about 10 km2, including a 1-km-wide lake and seven much smaller ponds. A guide recently reported that he found a depression 200 m deep in place of the lake. The lake may form and empty periodically, as many ice-margin lakes do. 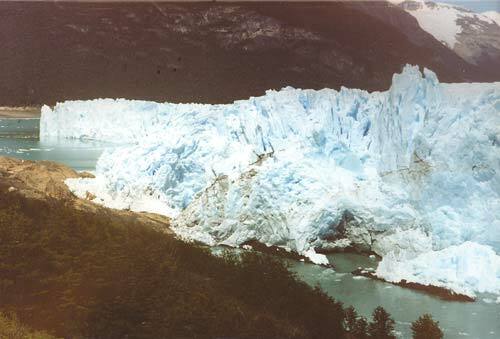 Figure 43.--South part of the calving front of Glaciar (Perito) Moreno on 27 November 1993. The glacier touches the opposite bank for a short distance. The level of Brazo Rico (left) has only risen slightly. It drains into Lago Argentino (right) by a small subglacial conduit at the very edge, a route favored by the orientation of rock strata. Photograph by Louis Lliboutry from an overlook built by the Parque Nacional de Los Glaciares. Figure 44.--Nunatak del Viedma from Paso del Viento (in fig. 29) in February 1994. In the foreground is the huge lateral moraine of Glaciar Viedma; three conspicuous tephra bands can be seen on the glacier surface. Behind is the Nunatak del Viedma with Cordón Mariano Moreno within the clouds. Photograph courtesy of Pedro Skvarca, Instituto Antártico Argentino, División Glaciología, Buenos Aires, Argentina. On the Chilean side, the departure points for access to the periphery of the northern ice field are Coihaique (about lat 45°30'S. and long 72°W.) and Chile Chico on the south shore of Lago Buenos Aires/General Carrera. Punta Arenas (about lat 53°10'S., long 70°55'W.) and Puerto Natales (about lat 51°40'S., long 72°30'W.) are departure points for visiting the Chilean Torres del Paine National Park and the south tip of the SPIF. The Pacific Ocean side of this ice field remains difficult to access, and the time of exploration is not over (for example, see Hickman and Newton, 1987). It must be emphasized that today trekking, technical climbing, and serious glaciological work separately demand quite different people and logistics. Glaciological and related meteorological or limnological investigations have been done mainly by Japanese scientists: Renji Naruse (Institute of Low Temperature Science, University of Hokkaido, Sapporo), Chotaro Nakajima (Disaster Prevention Institute, Kyoto University), Hiroyuki Enomoto and Masamu Aniya (University of Tsukuba, Ibaraki), Tetsuo Ohata (Water Research Institute, Nagoya), and many others. After preliminary work in 1967, 1969, and 1981-82, the [Japanese] Glaciological Research Project in Patagonia studied the NPIF during the summers 1983-84 and 1985-86. The Chilean glaciologist Gino Casassa joined them and determined ice thicknesses by use of gravimetry. In addition, Glaciar Tyndall, in the SPIF, was studied (Naruse and others, 1987; Kadota and others, 1992). Since 1990, with the collaboration of the Argentine glaciologist Pedro Skvarca, two other large glaciers of the SPIF have also been studied, Glaciares (Perito) Moreno and Upsala. All the results have been published by the Data Center for Glacier Research of the Japanese Society of Snow and Ice, first as ad hoc publications (Naruse, 1983; Nakajima, 1985) and then in its Bulletin of Glacier Research, nos. 4 (Naruse, 1987), 10 (Naruse and Aniya, 1992), and 13 (Naruse and Aniya, 1995). A comprehensive review of glaciological studies in Patagonia was published by Warren and Sugden (1993).